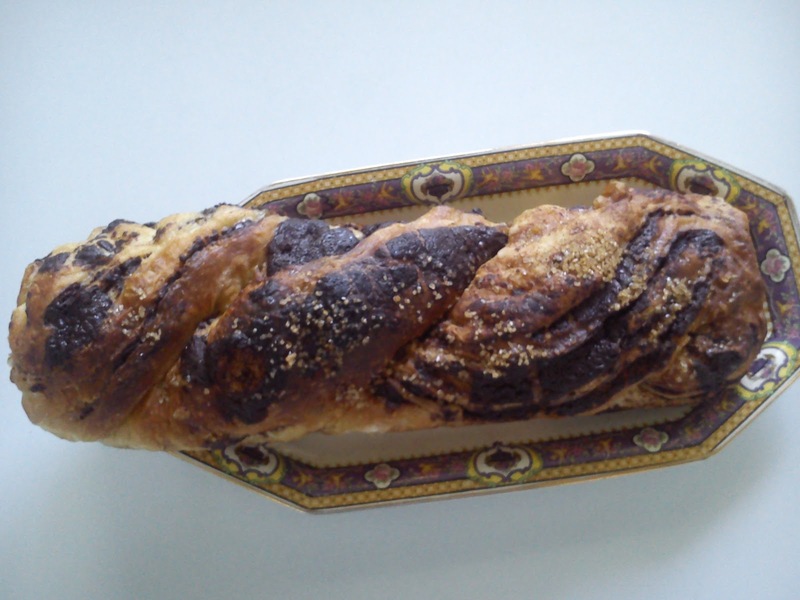 La Gerusalemme Cucinata: Behold the kranz! You know the bit in Julie and Julia when Julie needs to debone the duck? The kranz was sort of the equivalent for me (albeit I'm not attempting to cook all of Jerusalem, that would be slightly insane). But the kranz comes with a warning that it's "neither easy nor quick to make", i.e. not generally what I go looking for in a recipe. So I decided it would be a nice challenge for those lazy, cooped-up days around Christmas. It turned out more of a challenge than I expected, and not for the reasons I thought. Suffice to say, it's supposed to sit overnight but it took three flippin' days to make. Something didn't quite go as it was supposed to, though I managed to fix it. Still, this is a labour of love. I still haven't gotten round to explaining what a kranz is: it means "crown" in German and is a uber-Askhenazi cake (one of the few in this more Mediterranean-centred book) with a chocolate filling that is made into two "braided" parts (hence the crown or garland). Here is my recipe, with my adaptations and the further adaptions I plan to make should I attempt to repeat the experiment. The original recipe calls for pecans. I don't really do pecans. Place the flour, sugar and yeast in a mixer and stir everything together (I'm going to do this by hand next time). Add the eggs and water and continue stirring until the dough comes together. Add the salt and start adding the butter, a few cubes at the time. Continue mixing for about 10 minutes until the dough is elastic and shiny. Place the dough in a large bowl, brush with sunflower oil, cover with cling film and leave in the fridge overnight. This is where the drama began, because the dough didn't grow overnight and I didn't get to sleep in for no reason! So I left it to sit the whole day, out of the fridge this time, and ended up adding a bit of water. So, by the evening, it had finally grown and could move to second part of the recipe. I'll leave out of the fridge next time. Melt all of the ingredients in a saucepan. Spread the dough with a rolling pin and cut the edges so that it's more or less rectangular. Now the scary part comes, which isn't really so scary. Spread the chocolate paste on the dough. This caused further drama, since the filling was liquid, I assume it's supposed to be a Nutella-like paste. Maybe more chocolate would do the trick? Anyway, if I say so myself, I brilliantly solved the problem by later putting the roll in the fridge. Brush with water the long end further for you, then start rolling the long section that's closer to you. You end up with a rolled-up sausage. Put in the fridge so the filling becomes solid. Then, more of the not so scary scary part: cut the roll lenghways and weaves together the two parts, ideally letting the sectioned part up so that the chocolate "drawing" shows. Put in a baking tin and leave in the fridge overnight. Bake for 40 minutes at 190 c.
Now, once the feat was accomplished, what did the kranz actually taste like? It tasted nice, but not as heavenly as to justify all this work. This is a recipe that definitely needs fiddling with and practice. But I definitively learned some things from it, namely how to create plaited cakes with filling. Labels: cake, chocolate, dessert, in which I mess something up. If I may give you a suggestion, I think the yeast wasn't probably very vital. The passage in the fridge is essential so that the dough matures and fully develops its flavour and aroma. Next time mix the yeast with a little flour, say 50 grams, and 1 tsp sugar and leave it to rise for 1 hour, before going on with the recipe. Oh, actually someone reads here! Thanks for the tips. I'll try that next time, if there is a next time, since I found this case was a lot of work for the result it gives.